A brief history of the San Diego & Palm Springs CCCA Region. Bob Steiner, Sr. National CCCA Member and Region Charter Member, both native San Diegans. 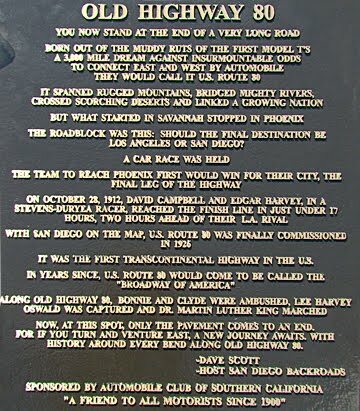 The San Diego/Palm Springs Region started in part with unique but challenging geography. A world class bay on the Pacific, forested mountains steeply rising 40 miles to the east, a cultural and political border with Mexico to the south, and a 100 mile separation from the sprawls of Los Angeles and Orange County to the distant north. Appreciation for these classics attracted like thinking local residents who helped each other in keeping their classics running, and in frequenting the wrecking yards that held so many treasures, for such small prices. (When gas was $.18 per gallon, here in 1950, it was $.10 in Tijuana. A weekly trip across the border provided enough gas for a week of driving to work.) In 1990, Nick Fintzelberg and Glenn Yeackel started a touring region to enjoy the many benefits of having a beautiful drive to Palm Springs and the desert in the winter, while touring the sea coast in the summer. What could be better? Many agree this local region has a membership of active, fun participants, and a catalogue of wonderful classics, that has led Caravans and hosted both Grand Classics and the winter Annual Meeting. We share a friendly camaraderie with regularly scheduled local tours and social events. We share our enthusiasm and expertise, and sometimes our spare parts, with one another.